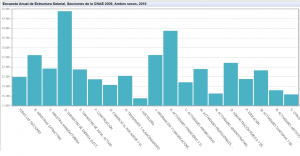 Según la Encuesta anual de estructura salarial que tiene en cuenta la serie de años desde 2008 a 2016 publicada por el Instituto Nacional de Estadística – INE, la ganancia media anual por trabajador del Sector de suministro de energía eléctrica, gas, vapor y aire acondicionado es la mayor de España con casi 51.000 €. Le siguen el Sector de actividades financieras con algo más de 42.500 € e Información y comunicaciones por un lado e industrias extractivas por el otro con unos 32.400 € de media. 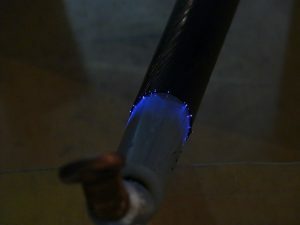 En la Universidad Carlos III de Madrid puedes cursar el Grado en Ingeniería Eléctrica que forma profesionales cuyo perfil coincide con el demandado por las empresas de suministro de energía eléctrica. In the early works to determine the exact site where partial discharges (PD) are happening in a 12/20 kV XLPE high-voltage cable, we need to know what are the previous conditions of such conductor. We are using a cable that has been stripped in the ends to show all layers. 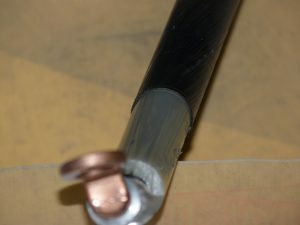 The shielding has been removed and connected to ground in both ends and the internal conductor has been connected to the rated high voltage. Two high-frequency current transformers (HFCT) were clamped to the grounded shieldings and the signals in the oscilloscope showed that we had a stable and important activity of partial discharges. However, we didn’t know exactly what type of PD we had since the outcome of the phase-resolved PD pattern was not clear: might be a mixture of corona and surface discharges. The next photographs were taken to cast some light on what was happening in the cable at 12 kV. The first one was taken with an automatic exposure and artificial illumination and the second one was taken with an exposure of 60 s and automatic aperture without external light. It can be clearly seen the glow of the discharges and how some of them reached the surface of one of the layers. This information helps in determining why the time-length of the pulses seen in the oscilloscope was so long: 2-3 microseconds till the oscillation was completely damped and the amplitud was much higher than expected. Without a previous calibration to picocoulombs we know that internal discharges peaks may reach 10-20 mV and we were having pulses with peaks in the 1000 mV range which can only be associated to high-energy surface discharges. Now, knowing the previous condition of the cable we may start creating internal defects to determine the time-of-flight of the pulse and, hence, to find out the discharging site. Si te interesa estar al día en temas relacionados con la Ingeniería Eléctrica, tener acceso a becas y ofertas de trabajo en empresas del sector, cursos de formación continua y presentaciones de tesis puedes unirte al grupo de Linkedin del Departamento de Ingeniería Eléctrica de la Universidad Carlos III de Madrid. Además, contarás con la oportunidad de establecer contacto con profesionales y estudiantes con los mismos intereses que tú. Condition monitoring (CM) of high-voltage (HV) insulation systems is essential for establishing a correct diagnosis regarding the health of these costly and safety-critical industrial assets, as well as for implementing practical condition-based-maintenance (CBM) regimes. The assets being monitored may include rotating machines, power transformers, HV cables and accessories, air-insulated-substations (AIS), gas-insulated-switchgear (GIS) and overhead lines. Recent advances have seen widespread development of non-contact electromagnetic wave sensors for detecting and locating partial discharges and electrical arcs. These sensors play an important role in periodic testing, continuous monitoring or ‘fingerprinting’ of RF emissions from HV equipment. Practical applications of UHF and other RF techniques are leading to the development of new sensors and associated solutions for signal acquisition, processing, analysis and interpretation, which in turn require new approaches to decision making about the condition of assets being monitored. The aim of this Special Issue is to report on recent advances relating to the following themes: (1) non-contact electromagnetic sensors (RF, UHF, near field, electric, magnetic, etc.) used for detecting signals emitted by insulation defects either internally, or external to the equipment in question; (2) practical methods for integrating these sensors into real equipment for use in condition monitoring; (3) case studies and examples of implementation of the techniques in an industrial or laboratory setting; (4) sensor models to support the design process or for predicting their response (using data-driven modeling approaches, for example); and (5) bridging the gap between condition monitoring research and subsequent decision making using these technologies, possibly in combination with other monitoring parameters. Submitted manuscripts should not have been published previously, nor be under consideration for publication elsewhere (except conference proceedings papers). All manuscripts are thoroughly refereed through a single-blind peer-review process. A guide for authors and other relevant information for submission of manuscripts is available on the Instructions for Authors page. Sensors is an international peer-reviewed open access monthly journal published by MDPI.